Laid-back handyman Zorg spends his time doing odd jobs on beach-front chalets, making chilli and harbouring dreams of becoming a writer. His life is turned upside down with the arrival or the beautiful but volatile Betty. They begin a romance fuelled by intense passion but as Betty turns increasingly violent and self-destructive, Zorg tries desperately to halt her slide into insanity. One of the most iconic film in modern French cinema history, Betty Blue (not a terribly accurate translation of the original French title 37°2 le matin) finally arrives on UK Blu-ray in a self-proclaimed "Deluxe Edition" this month courtesy of Second Sight films, who have been doing a rather spanking job on cult cinema titles in recent months. Jean-Jacques Beineix's erotically charged and visually intoxicating film heralded the arrival of new screen icon Béatrice Dalle, who subsequently featured in Jim Jarmush's Night on Earth, Yolande Zauberman's Clubbed to Death, Michael Haneke's post-apocalyptic Time of the Wolf and Alexandre Bustillo and Julien Maury's punishing Inside. 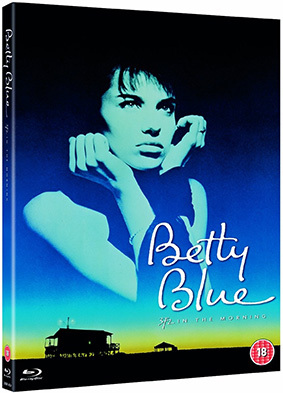 Betty Blue Deluxe 2 Disc Edition will be released on UK Blu-ray and DVD by Second Sight on 25th November 2013 at the RRP of £19.99 apiece (always nice to see Blu-rays priced the same as DVDs).